If you have a question about goCAMPUSing there’s a good chance someone else has asked it too. Check out our FAQs to see if we can quickly answer your question below. Don’t see your question? Shoot us an email or visit our CONTACT US page! Why is visiting a college campus so important for a high school student? Visiting a college campus couldn’t be more important. No matter what a student or his or her family thinks they know about a particular college, a lot can be learned from spending some time on a campus and being able to talk to people who go there. A critical finding is always the “right fit factor”. Nothing gives a potential student the “good” or “definitely not for me” vibe than actually being on a college’s campus. Is it distracting to take a high school student on a college campus tour with dozens of other high school students? How important is visiting a potential college with parents/guardians? A goCAMPUSing tour for High School students typically does not have the student’s parents coming along. 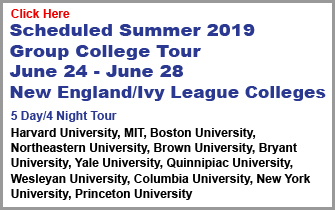 As parents of college and college bound children ourselves WE understand the difficulties there are in not only making the time but the costs and scheduling logistics of seeing more than one or two colleges. When you put together the costs of going to several colleges, between gas, lodging (for sometimes the whole family), plus food, and any entertainment along the way…trying to seeing more than two colleges is almost prohibitive. We do think it is very important for parents at some point to revisit specific colleges with their children but only those that they are truly interested in. Then there is the: “I don’t want to go visit any colleges” line that so many teenagers say to their parents. In fact, many DO want to see what college campuses are all about BUT just NOT with Mommy and Daddy. Just look at a typical college tour with parents. The parents are following the guide while the kids are walking way in the back not hearing a thing and not asking any questions. And when a parent asks a question their children are mortified. On a goCAMPUSing tour, the students develop a sense of responsibility and involvement. They realize how little they know and they are among fellow students who also don’t know. Questions to college administrators, guides, and students on campus flow freely. In the goCAMPUSing atmosphere the HS Students become engaged and interact as key participants and not just tagging along with Mom and Dad and maybe fighting siblings. Most, if not all HS Students returning from a goCAMPUSing tour experience a growth in their understanding of not only what different colleges are like, but the entire college process becomes REAL. Many parents have expressed that they notice a level of maturation in their children, now taking high school more seriously, having more conversations about colleges, and most importantly they ask their parent to take them to see other colleges that they NOW understand might be a “good fit” for them in location, majors offered, socially, culturally, and affordability. 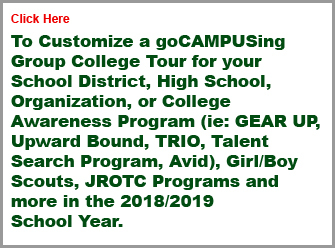 At goCAMPUSing we encourage independence and empowerment, but we always stress the importance of having them involve their entire family in the college selection process and strongly advise them to visit their select colleges WITH their parents when they have narrowed down their choices. Why is it important to visit so many colleges? A basic rule of thumb in the college selection process is to visit at least 3 schools, but considering that there are over 1,700 colleges in the US, all offering different student enrollment sizes, geographic, locations, entry requirements, academic offerings, sports programs, clubs, housing, scholarships, students mixes, and campus social life, to name only a handful of factors; being able to see and experience a variety of different college campus environments is very important. Many students and their families have preconceived notions about a school by name or reputation only to be surprised of what it actually is “firsthand”. 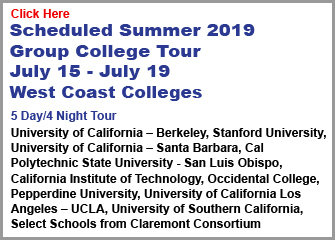 It is recommended to see a variety of colleges not only using the factors listed above but also visit schools that may be considered REACH colleges, the primary TARGET schools, and of course the SAFETY schools. At goCAMPUSing we say, “You don’t know…until you know.” A silly saying, but very true. What are Reach, Target, and Safety schools? Let’s start with TARGET schools. A target school should be at least three of the colleges a high school student would apply to and would likely be admitted to and attend. This has to do with the student’s grades, SAT & ACT scores, and other factors, including financial. It is important to note that although a student’s family’s ability to pay tuition is a major factor in college selection many schools offer financial aid, scholarships, cooperative plans, and other financial support mechanisms. Always investigate financial options with an accountant or a professional who is familiar with the college admission and financial aid and scholarship process. The advice an experienced professional can not only save thousands of dollars of tuition money but might open the number of college choices making an expensive college affordable. A REACH school is simply that, a college that a student would like to attend but doesn’t think that he or she has the qualifications and other criteria to be accepted. Reach schools don’t have to be Ivy League or the “best” colleges, but a college that the student would love to go to however his or her grades are at or below the average acceptance scores. Many with minimal acceptance requirement students are surprised to be accepted to their reach school but the child would bring something special to the college, has interest in a unique field of study, or simply provides the college with an element of greater diversity that would enrich the college’s community. A reach school might also be a reach because of financial reasons but it is always suggested to talk to a financial advisor who is familiar with the college process before ruling out a reach school solely for financial reasons. A SAFETY school should not be a last resort “anyplace who’ll accept me — ‘cause I have to go to college” school. With the tens of thousands of high school students applying to multiple colleges these days, many high school students are put on waiting lists, differed, and denied, so having a couple of safety schools is extremely important. A safety school is a college that a student is virtually certain to be admitted into. Students should make sure that these safety schools are colleges that they would be happy to attend in lieu of a college that they would be exhilarated to attend. It is better to be happy than dread or hate the college they expect to attend. It should be noted that many college students drop out of college during or just after their freshman year; keeping this in mind, many students who had gone to safety schools REAPPLY to their target schools for admission to the Sophomore class where seats have opened due to the reduction of the student body going into the sophomore year. Once again it is important for a student to visit their safety schools, some actually change their top choice to the safety school once they’ve actually seen and experienced the college campus in person. It is important to note that REACH, TARGET, and SAFETY schools differ from student to student. Besides their grades, SAT & ACT scores, community service, race, home state, or for whatever reason — each child has their own individual desires and criteria that a college has to meet. They might hate IVY LEAGUE schools, want a school where it never snows, or only want to go to a small college. That is why it is so important to have a student see and experience as many college campuses as possible, so that they can formulate what they like and substantiate their needs and wants list by visiting that, or a similar college campus. What does a goCAMPUSing college campus tour entail? Every goCAMPUSing tour is a little different. There are tours to the same geographical areas that encompass different colleges within those areas. But to attempt to be concise, each tour involves a bus ride, in an air conditioned Deluxe Motor Coach, or Deluxe Mini Coach . All trips have one or two qualified licensed and certified drivers to travel anywhere in the United States, as well as an appropriate number of goCAMPUSing staff member(s). All buses are USDOT certified for long and short motor carrier safety. There are trained goCAMPUSing college guides and chaperones on every tour bus. goCAMPUSing tour staff will provide information to the students during the ride and be able to answer questions about each college and how they might compare to similar colleges. Every student will be provided with a “handbook” with information pertaining to the schools they will be visiting. Complementary t-shirts will be given to every student, and possibly other corporate “give aways”. Each college visit will include a presentation from that college’s admissions department or a presentation will be given by a “college ambassador” from that college. Each college campus tour will include a walk through campus and time to stop and ask questions of “college ambassadors” and/or students on campus. Worksheets will be provided with many preplanned questions that students can ask or kindle other questions to ask. Within these workbooks students can also make notes and summarize their findings and impressions. Breakfasts, lunches, and dinners will be provided. Dinner will always include a hot meal. Where and when meals are served will depend on the tour. When staying overnight, students and goCAMPUSing tour staff will stay at area hotels. The names, addresses, and contact information of these hotels will be supplied prior to a tour. Unless otherwise arranged in advance, lodging will be double occupancy with 4 students per room, (welcome to college dorm life). Students will be segregated by gender. goCAMPUSing cannot guarantee room share selections, however if possible we will always try to comply to satisfy the students on the tour. To help assure the safety of ALL of our tours, hotel stays also include a security guard and/or guards positioned in the hallways while the students on the tour are in their rooms for the night. Many of the security guards goCAMPUSing uses are recommended by the college or by the local police department. Often the security guards are retired or off-duty police officers. On some occasions, if scheduling offers some non-campus tour time, goCAMPUSing arranges an extracurricular event. These events can include an area cultural event so the students can get a flavor of the “neighborhood” or attend college performance — ie: play, acapella group, or some other event, which can also be a sporting event — ie: basketball, football, baseball, lacrosse, etc. At the end of each goCAMPUSing tour we hand out review forms so the students can critique the trip and make suggestions to make it better and keep it relevant. And so far, their experiences have been pretty good and we’re doin’ okay with them. What cities and states does goCAMPUSing service? That’s a two part question. First we get the majority of our high school students from Long Island High Schools, because that just so happens to be our backyard and where we started goCAMPUSing. We do get a few students who attend NYC high schools. These NYC students either come to the tour starting point via car or Long Island Rail Road, or on a few rare occasions when the number of NYC students warrants it goCAMPUSing will have a NYC starting point to board the tour bus. If the question by service means — what states and cities do we travel to — well that depends on each individual trip. goCAMPUSing may drive through states to reach another state and school destination. 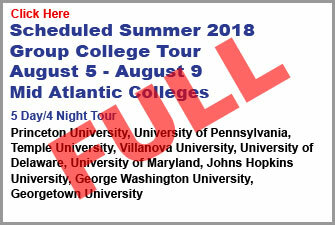 We currently have established college tours to several states through and including: Alabama, Connecticut, Delaware, Florida, Georgia, Illinois, Kentucky, Maine, Maryland, Massachusetts, New Hampshire, New Jersey, New York, North Carolina, Ohio, Pennsylvania, Rhode Island, South Carolina, Tennessee, Vermont, Virginia, and Washington DC. We do offer WEST COAST college campus tours as well, but these are usually special tours and incorporate air travel and special arrangements. What makes goCAMPUSing different from other college campus tour companies? Two things: One — we didn’t start out as a tour bus company creating college tours to fill buses. Two — our staff not only understand the college selection and admissions process, but many of goCAMPUSing staff have established relationships with a number of college admissions departments. This insight and understanding of what college admissions departments are looking from applicants helps goCAMPUSing students on tour better understand each college they visit. And just to add a little more…a Two point One sort of speak…some college campuses we visit have a goCAMPUSing Ambassador on campus to provide increased insight and uncensored information regarding that college’s campus life. What should a student bring with them on a goCAMPUSing tour? Well, every student should not only bring a change of clothes for each overnight stay, as well as the usual toiletries — toothbrush etc, BUT it is strongly advised that they bring sneakers or a good pair of walking shoes. Too often students come with “flip flops” and due to all the walking on campuses their feet begin to hurt rather badly, and some flip flops aren’t substantial enough and can fall apart. So a good pair of walking shoes is a great idea. Also every student will be responsible for at least ONE meal each day — either a LUNCH or DINNER. So students MUST bring enough money to purchase a single meal for each day of the goCAMPUSing tour. Whenever a student is required to pay for their own meal goCAMPUSing will seek an affordable eating place and it may at times be a College’s Cafeteria or a eatery that serves a “local” food, (ie: in the Philly area we try to find a place where the students can try the local fare: Philly Cheese Steaks). We also try our best to address the more finicky nutritional wants whenever possible. And lastly, goCAMPUSing has experienced that many students like to visit a college campuses “book” store, where they can purchase t-shirts, mugs, hats, etc., so if they plan to buy an item from a college PLEASE make sure they have enough money available to them to make the purchase. Can I cancel a goCAMPUSing tour and get my money back? I guess we’ve been lucky so far, no one has canceled a scheduled trip, BUT we have established a set Terms and Conditions on this website and one of them does cover our cancelation and refund policies. We would ask you to refer to that webpage: Terms & Conditions and read item #10.